It’s not often that I get excited for a Microsoft event, but I love it when it gets to happen. When the company paired with Nokia, I was excited. When it launched the Lumia line of phones, it happened again. So today, as the company announced its new Surface line of tablets, I’m happy to say that I was looking forward to what it would bring. Fortunately it appears that Microsoft has made good on the hype that has built up over the past few days. Surface, in and of itself, looks amazing. It is exactly the move that Microsoft has needed to make, manufacturing its own, premium line of Windows-running hardware. But as much as I want to praise the company, there are a few things that were catastrophic mistakes, and they may just spell the doom of the tablet before it even launches. First let’s look at what Surface is. It’s a tablet form factor, but it has the guts of a PC, at least in its higher-end form. The lower-end version, with the ARM processor and running Windows RT, is going to be a niche item at best. The Pro version, which will run a full Windows 8 installation, is going to be more in line with what users are looking to buy. You could say that it’s a direct competitor to the iPad, and you’d be right. But you’d also be right to say that it’s a competitor to the MacBook Air. This is a laptop, every bit as much as it’s a tablet. The detachable keyboard cover is slick, and if it works as good as it looks, it’s a no-brainer to take it with you everywhere. But perhaps more important than what it is to the consumers is what the Surface means to Microsoft’s OEM partners. Essentially, this is the device that none of them would have ever made, so Redmond did it themselves. There isn’t a single Windows OEM partner that makes hardware this nice, and that’s important. So if the device is nice, and has huge potential in the market, where did Microsoft go wrong? Let’s talk about it, starting with the fact that there’s no availability. If there’s one thing that Microsoft could learn from Apple, it is “announce and ship”. Today we saw the Surface. When can we buy it? The only thing we know is that it will be available in conjunction with the release of Windows 8. That is, to say, not today. We also don’t know the price. We have a range, but not even a solid one. The RT model will be priced in line with other ARM-based tablets, and the Pro version will hit the range of “Intel-based Ultrabooks”. In case you’ve not been following along, Ultrabooks have a price range from somewhere around $500 to upwards of $1200, depending on the model. You simply can’t be that vague with a device that holds such an iconic potential. The last point that really bothers me is in the naming convention. First off, Surface has been around for a while. 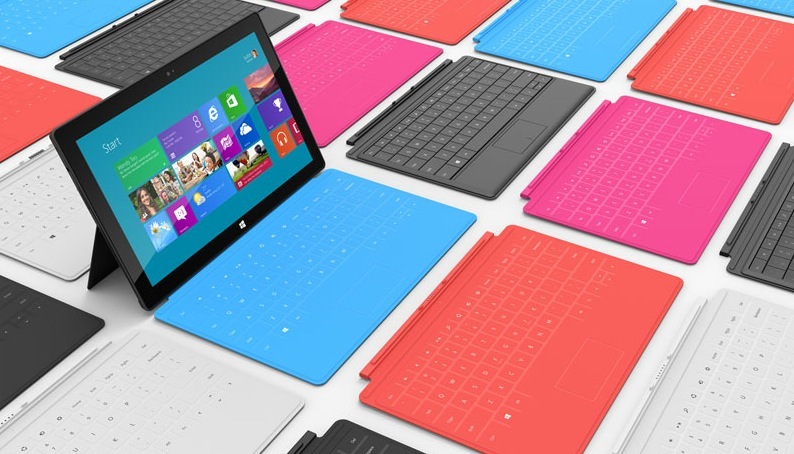 In fact, it was just last year that the company announced the Surface 2. But this is no tablet. It’s a huge, poorly-selling showpiece, running Windows 7. Doesn’t it muddy the waters, so to speak, to name your new tablet the same thing as your nearly-vaporware device that you’ve had for years? To make matters worse, the device is either a Surface or a Surface Pro. The former being the Windows RT version (read: stripped-down, cheaper) and the latter being the Windows 8 device. Nomenclature is important, and Microsoft sorely missed the boat here. Tell us a story, Microsoft. But don’t leave out the details.